In the world of kitchen backsplashes, simple white subway tile might seem like a viable option, but it’s also a tad predictable. Instead, consider how a backsplash functions in your space. More often than not, it may stand in as an element of chromatic balance, giving an intricately decorated kitchen a momentary element of visual relief. Alternatively, it can be an opportunity to add a bold dose of character and interest to an otherwise neutral space. Regardless of which it may be, a kitchen backsplash is an area brimming with potential. When it comes to selecting the appropriate tile, there are a number of factors to consider: Shape, style, size, and finish are all integral details that warrant careful thought and consideration. Not sure where to start? Ahead, we rounded up a handful of beautifully designed kitchens, where the backsplash stands in as the undisputed star of the space. See for yourself. This kitchen ticks multiple trend boxes: It features a great farmhouse sink and rustic-mod cabinetry crafted of untreated wood. But it’s the backsplash that takes things to the next level. The mini hexagon tiles immediately capture the eye, extending an intricately detailed element of visual depth. Our eyes immediately go to this wildly untraditional backsplash tile, but the patterned floor tile and complementary cabinets are equally fabulous. Make sure your tile choices speak to one another—that’s the key to kitchen success. Not all backsplashes are created equal, and embracing a material other than tile is definitely something we can get behind. 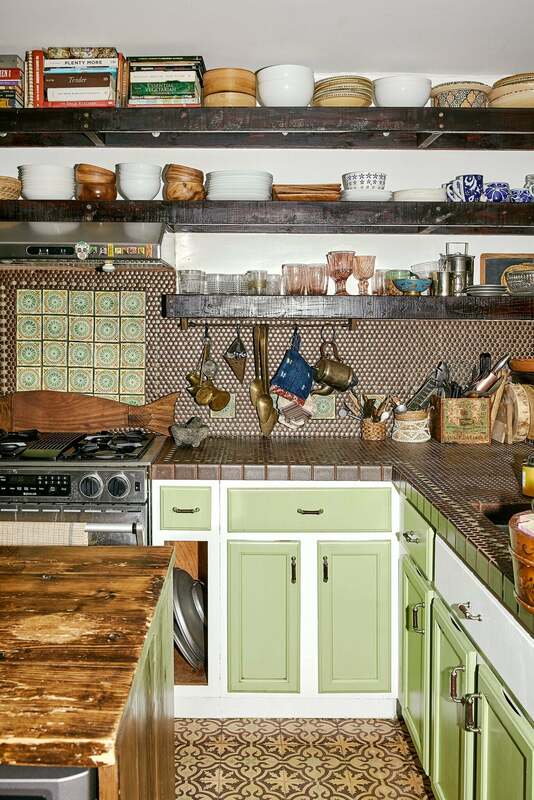 Take notes from this Brooklyn abode, where whitewashed brick makes for the ideal counterpart to the warm wood shelving and the eclectic slew of boho-inspired accessories that surround it. Let’s analyze why this backsplash got it right. Since it’s my kitchen, I can speak to this firsthand. I knew I wanted white cabinets to brighten up the space, but I didn’t want the room to be boring. Instead, I made the backsplash the star of the show. I chose a fun fish scale tile shape and incorporated ocean-inspired colors. This was my way of twisting the navy kitchen trend into something a bit less expected. If you do gravitate toward the clean look of simple white subway tiles, try an unexpected grout color It’s bolder than white on white. This backsplash got it right with gray grout. It frames the white tiles and makes them pop more than they would if surrounded by white grout. Are you looking to create a moody space like this? Here’s the how-to: Start with ever-popular navy cabinets and a slick marble slab countertop. Then choose the right backsplash. These glossy black tiles do a lot for the feel of the space—just imagine how different the room would seem with white tiles. This backsplash tile is unlike anything we have ever seen. From a distance, it looks more like wallpaper than ceramic tile. The repeating pattern takes this space from simply chic to extraordinary. This tight, Art Deco–inspired pattern works perfectly with this flexible faucet. It’s a surprising choice that really catches the eye. Normally, you choose a trendy tile color—not a wild shade of grout. But this backsplash is totally twisted. A peachy pink tone surrounds the fun Moroccan shape.